These varieties are not available in every market, so contact your local council to inquire about the cookies they will carry this season. In the tri-state area, the Girl Scouts of Eastern Pennsylvania and Girl Scouts of Central and Southern New Jersey will be offering the Trios, while Girl Scouts of the Chesapeake Bay (Delaware), Girl Scouts of Northern New Jersey, Girl Scouts of the Jersey Shore (east-central New Jersey), Girl Scouts in the Heart of New Jersey (north-central New Jersey) and Girl Scouts in the Heart of Pennsylvania (Harrisburg area) will have the Toffee-tastic cookies. To find Girl Scouts selling cookies near you, visit www.girlscoutcookies.org or use the newly enhanced official Girl Scout Cookie Finder app, free for your iOS or Android phone or mobile device. 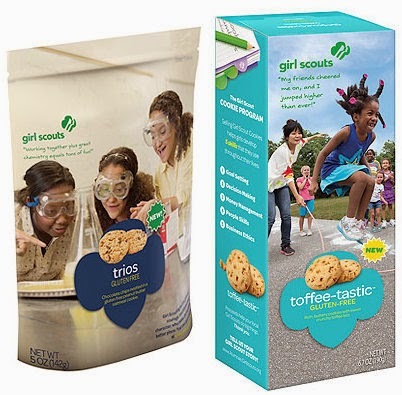 In addition to new tablet versions, the app's latest features for 2015 include cookie sale searches using selectable start dates, driving directions to nearby booths, an Instagram option for sharing, links to Girl Scout Cookie recipes and the ability for users to vote on their favorite Girl Scout Cookie.